As the ten-year anniversary of the Contemporary Arts Program (CAP) at Vizcaya approaches, curator Gina Wouters is hopeful about the future of the museum. She agrees that the former winter estate of James Deering will continue its legacy of art and agriculture. "The future is in the Village," agrees Wouters. Originally almost 200 acres long, the wealthy agricultural tycoon’s vast home included a farm, with fields for growing crops, animals in stables and a chicken coop, so inhabitants were self-sufficient with food. 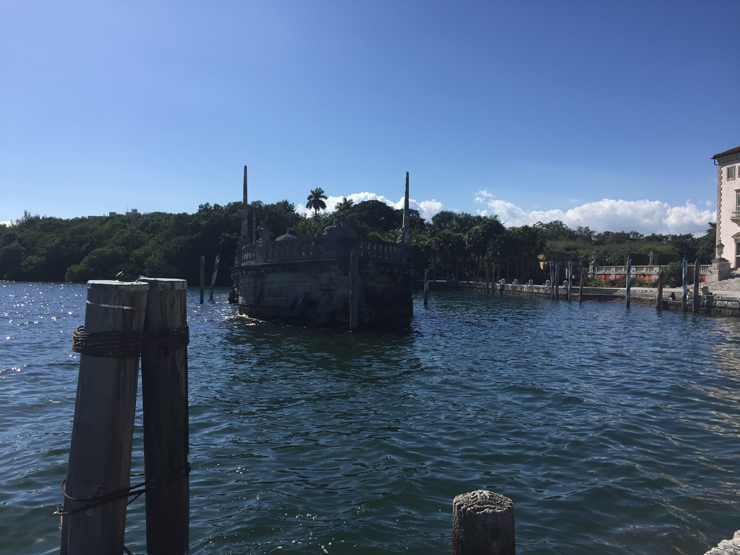 Now named Vizcaya Museum and Gardens, the property is roughly a quarter of its original size. Much of the land has been lost to other enterprises. 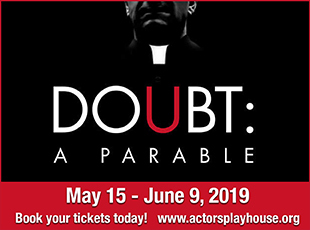 The Archdiocese of Miami took over the land next door and the former Planetarium inhabited the space across South Miami Ave., where remnants of the staff quarters, animal stables, and chicken coop still remain intact. It is known as The Village. At the first "Gardens by Moonlight" event of the year this month, visitors had the chance to explore the historic Vizcaya Village, not yet open to the public, and peruse the former staff's quarters, stables and garden. It looks like a village out of a fairy-tale. Were people smaller in those days? Everything seems so much smaller. Eventually, the Village will be open to the public. Now that the Planetarium is relocating to Museum Park, the space will be open for interpretation. Agricultural and artistic projects are in the works. According to Wouters, "CAP will begin to consider the Village spaces moving forward." In keeping with the tradition of growing food at The Village, an organic garden is maintained and the vegetables grown are used in the dishes served at the Vizcaya Cafe and Shop, yet there are no vegan dishes offered. Only cold-pressed juices, salads with cheese and a vegetarian burger are sold. It would be wonderful if more plant-based alternatives were made available. If more plant-based foods are introduced, the growth of the agricultural projects would make sense, and Vizcaya would grow into a greener future that Deering would have likely appreciated. Another tradition besides growing food at the estate is art exhibition. LEFT: Casino Roof. RIGHT: Glass Housein Casino. James Deering commissioned well-known artists of the time to create murals, paintings and sculptures at his home. He would be very proud to know that his legacy of art patronage has lived on. Currently, for the Contemporary Arts Program (CAP) curated by Gina Wouters, thirty-eight artists created various installations throughout The Village for the exhibition entitled “Lost Village.” According to Wouters: “Each of the works activated a part of the Village in a special way and was referential of the architecture, landscape and narratives.” The exhibition was on display at the first “Gardens by Moonlight” of the season last month. The upcoming "Gardens by Moonlight: Lost Spaces Edition" on Feb. 8, 2017 will further showcase the CAP's current art installations in the gardens, all part of the exhibition Lost Spaces and Stories: Phase II. LEFT: Glass House. RIGHT: Submergeddock. Brookhart Jonquit created "Glass House and Invisible Sun," in The Casino (little house in Italian), located at the Garden Mound. The buildings and mound were designed to shield the house and gardens from the sun's glare off the lagoon. “I am particularly in love with Brookhart’s installations in the Casino rooms. 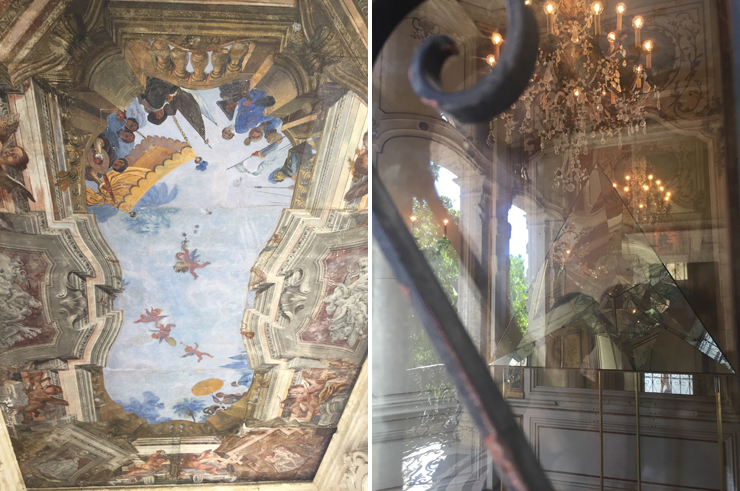 The pieces are very powerful on their own, but the dialogue between the contemporary aesthetic and the historic interior is one of the most interesting parts of the site-specific nature of CAP in general,” says Wouters. The Casino consists of two small adjacent round rooms decorated with crystal chandeliers, a painted Renaissance ceiling, gilded designs and exquisite antiques. One imagines that they were probably used as tea or game rooms. The artist incorporated fancy elements of the space, translating them into two ornate glass sculptures. One of the reflective, shiny monuments resembles a house of cards and the other looks like well-sculpted diamonds, parlaying an infusion of the display of wealth characteristic of the villa's era along with the activities that Deering and his guests may have engaged in at the space. Right behind the Casino is the lagoon, and relics of docking stations remain. Deering and his guests mounted gondolas at these small docks and rode around the estate. Now, the lagoon is overgrown with mangroves, and on the other side is the Archdiocese’s land, on which a few relics of the estate remain. Nearby, a walking bridge used to get to the other side of the lagoon is cut off from guests at the border, where the land was separated. Near one of the docks, Mira Lehr and Yara Travieso designed a whimsical installation with dark, nautical elements and colorful, floral designs that pop out from the twisted mangroves. Reminiscent of fishing nets and ropes, various handmade pieces hang on the trees' intertwined limbs. Interwoven cocoon-like lanterns contain red, orange and yellow flowers. The installation is accompanied by a dance element titled “Dido and Aeneas,” which evokes the exotic wildlife that once existed on this side of the property. It will be performed at the CAP’s anniversary part in May. One can still find crabs, iguanas, butterflies and birds in this bustling, preserved waterfront ecosystem, and, hopefully, not encounter any larger organisms like alligators. These enormous reptiles lay their eggs in the surrounding swamp one hundred years ago, a threat to Deering and his guests. But the landscape and ecosystem have been altered significantly since Vizcaya was built. The most impressionable change is the rise in sea level due to climate change. The last steps of various docks around the estate are submerged. The Barge, a few feet from the main house, also appears slightly sunken; its steps are practically underwater. Made of oolithic limestone, many of them are slightly eroded as well. So, what will happen in another 100 years? Will Vizcaya be underwater as scientists predict, a lost city like Atlantis? It seems possible since the main cause of climate change is animal agriculture, and people aren't making major changes in what they consume; animal flesh and products are still the main staples of most country's diets although China has already moved to reduce meat consumption by half. I think James Deering would have wanted to continue the tradition of growing food on his premises, which is what Vizcaya plans for the future. It makes sense that Vizcaya become greener because the future is right around the corner. The only way to preserve the planet is to conserve green spaces for growing food instead of destroying them to grow cattle. And right around the corner from Lehr and Travieso's exhibit is "A Fragmented Casba," Leyden Rodriguez Casanova's project. It presents deconstructed pieces of the Casba, which has been lost to the Archdiocese. With modern materials, the artists recreated aspects of the ancient buildingincluding pieces of the roof's dome and its Greek columns. 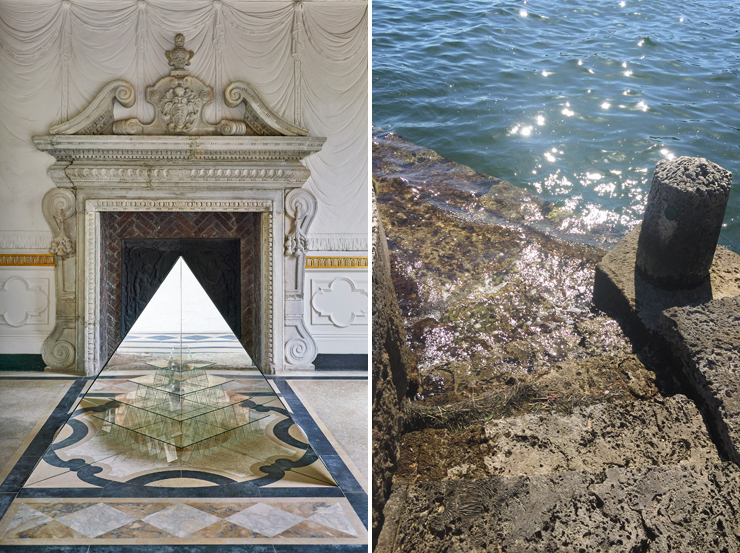 The installation alludes to the possibilities of reimagining and rebuilding the villa's lost spaces or the possibility that in the future all that will remain of Vizcaya are deconstructed parts, fragments or relics. Vizcaya is a magical, dream masterpiece of landscaping and architecture. Everyone should take advantage and visit the museum while it lasts. No one knows for certain what the next centennial will bring, but scientific predictions mixed with the current, climate-change denying administration tell a bleak tale. "Gardens by Moonlight: Lost Spaces Edition"